So how did everyone do the first week of lent? I am still getting into the swing of things but so far so good. I participated in a #CatholicScopes hop on Friday about lent and it was a lot of fun. So many resources and information was shared. I hope to participate again soon. Thanks to everyone that has linked up so far. We’ll be using the same link-up all of lent so we can always check out the new and old posts if you join in later on in lent. Make sure to visit your “neighbor” and show them some love. This week we have 6 prompts to choose from. 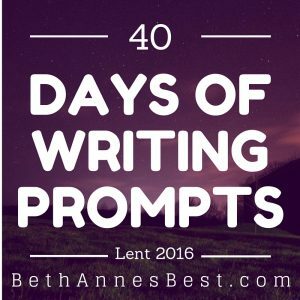 Here are this weeks’ Writing Prompts. 6. What are you favorite Lent or Easter books? 7. Write about a time that you received a sign from God? 8. Reflect on your favorite Lent or Easter hymn. 9. What almsgivings are you doing this lent?